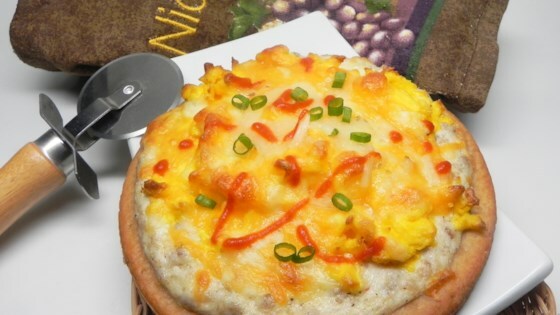 "The great tastes of biscuits and gravy on a pre-made pizza crust. Scrambled eggs and cheese make it a filling meal." Place pizza crusts on a baking sheet. Bake in the preheated oven until lightly browned, about 5 minutes. Remove from oven and leave oven on. Heat a large skillet over medium-high heat. Cook and stir sausage until browned, 5 to 7 minutes. Remove sausage with a slotted spoon; drain on a paper towel-lined plate. Reduce heat of skillet to medium-low. Melt 1 tablespoon butter in the skillet. Add flour; stir until dissolved to make a roux, about 1 minute. Add half-and-half; stir to remove browned bits from bottom of the skillet. Cook and stir until thick, about 2 minutes. Season gravy with pepper, salt, and onion powder. Return the drained sausage to the skillet; stir to coat with the gravy. Remove from heat; divide sausage gravy evenly over the pizza crusts. Melt the remaining butter in a small nonstick saucepan over low heat. Pour in eggs; cook and stir until scrambled, 3 to 4 minutes. Remove from heat; divide scrambled eggs evenly over the pizzas. Top with Swiss cheese and Cheddar cheese. Bake in the hot oven until cheese is melted, 3 to 4 minutes. See how to make a delicious egg, ham, and cheese breakfast casserole.